Game safari in Queen Elizabeth Game park rewards you with the different antelope species including the waterbuck. Uganda is a birder's paradise, you will have a chance to see plenty of birds including the endangered shoebill stork. Gorilla Encounters both in Uganda and Rwanda do not leave you the same, these gorilla encounters have been described by many as 'magical moments',why not relive these gorilla encounters magical moments yourself. Our Gorilla Trips Uganda are affordable and flexible and when you book your gorilla trips Uganda with us, we will help you acquire a gorilla tracking permit, for your gorilla trips and also find you where to stay and even transport you during your gorilla trips Uganda. 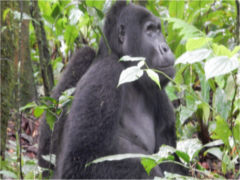 Gorilla Tracking Uganda takes place in both the north and south of Bwindi Impenetrable Forest popularly named the groilla park moreover with Gorilla Tracking Uganda can also be visit Mgahinga park another park where gorilla tracking Uganda takes and it is close to Volcanes park Rwanda. Explore the "wild west of Uganda" a safari which takes you to the most spectacular and most isolated parks in Uganda giving you a chance of interacting with the local communities. 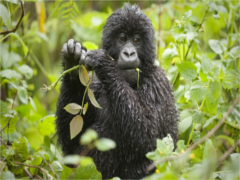 Spend time on a Rwanda gorilla tour visiting gorillas in Volcanoes park and relaxing in beautiful sandy beaches aplus participating in other optional activities like boat rides in Lake Kivu Rwanda. Fly on a scheduled flight to see gorillas in Bwindi Forest Uganda and enjoy the sightings of the big five in the Masai Mara Kenya by air. Expect to see the animals of the savannahs (elephant, buffalo, giraffe, hippo, leopard, lion). 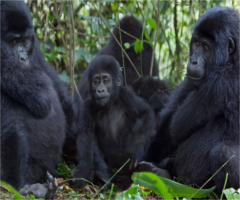 2 Days Gorilla tour Rwanda to visit Volcanoes national park known for gorilla trekking in Africa and its ranked as the best destination for short gorilla trekking adventures. You will visit the two popular Tanzania wildlife destinations. Ngorongoro Crater is often called Africa’s Eden and the 8th Natural Wonder of the World. Serengeti is well known for the wildebeest migration which can’t be seen anywhere else in the world.